Enjoy the Gaches Mansion dressed for a Victorian Christmas with quilts and textiles from our permanent collection. Explore all three floors decorated in the styles popular during the long reign of Queen Victoria (1837-1901). On display will be one of the oldest pieces in our collection, an 1840s Bethlehem Star. We will also feature 1850’s red & green applique quilts, 1860’s Civil War era quilts, 1880’s Crazy Quilts, and Geometric quilts popular after 1890. Enjoy a cup of hot cider on the weekends. ​Textile artist, Elin Noble, will transform the third floor galleries into an installation using itajime dyed silk organza. Her black and white silk panels feature irregular horizontal and vertical geometrical shapes. The panels are hung in sets, allowing a play of overlapping shapes and moiré patterns. Also on view are pod-like three dimensional poetic forms. The Vox Stellarum series was made as a result of an invitation to create a response piece to the extraordinary prints published in the early 18centry by the Swiss theologian, Johann Jakob Scheuchzer, who hoped to prove that science and sacred scriptures were not mutually exclusive. The print that Elin responded to depicts a prophet who views future generations in the stars. Her inspiration came from the subject matter and the quality of the lines in the engraving. 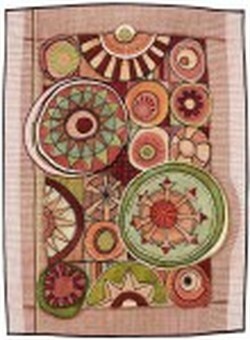 Elin Noble is a textile artist and dyer, and author of the award-winning book, Dyes and Paints. She has spent more than 30 years investigating the nuances of applying dye to cloth. In the last 10 years she has focused primarily on a historical clamp-dye resist process from Japan known as itajime, a process by which luminous and complex colors and patterns are dyed on cloth. Elin has exhibited her cloth and quilts widely, most recently in the traveling exhibitions Fiberart International 2013; Quilt National ’13 where she won the Japan Prize; Energy Nexus in Hong Kong; Earth Friendly Alchemy: Exploration in Natural Dyeing in San Antonio, TX; East and West: Asian Influences on Contemporary American Craft at the Ohio Craft Museum; and Elin Noble: Fugitive Pieces at the Visions Art Museum in San Diego, CA. Elin lives and maintains a studio in New Bedford, Massachusetts. Learning to hand stitch at nine years old, Grace Hawley took to Hawaiian quilting naturally. Her first Hawaiian quilting class was in 1985 with teacher, Gail Chamberlain, while living in Kwajalein, Marshall Islands. The class project was to make one pillow; she completed two pillows by the time the workshop was finished. The next project was to make a quilt; inspiring Grace to create her first original quilt, Underwater Wonderland, celebrating her love of diving and incorporating the underwater life in the Marshall Islands. Grace made many small projects as gifts and progressed to full size quilts about 1990. Jack by Sandy Curran. Best of Show. ​The first floor of the Gaches Mansion hosts the blue ribbon quilts, wearables, and fiber art from our 2014 Quilt & Fiber Arts Festival. On exhibit will be Best of Show and all the top entries in each category; plus the pieces that have been given an Award of Excellence. Whether your passion is traditional quilts, art quilts, wearable arts or fiber arts, there are many fine examples on display. This is your opportunity to really study the designs and techniques of talented contemporary artists. 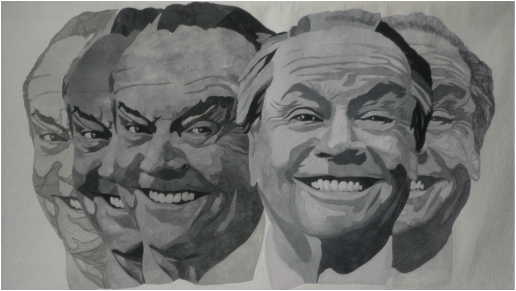 At right, Jack by Sandy Curran, 2014 Best of Show. Channeled Hearts by Sachiko Yoshida. ​Three years ago when the Tsunami attacked East Japan and washed away family members, homes and jobs, the American and Japanese people sent nearly 9,000 quilts to the survivors to keep them warm and comfort them. At the same time, instead of giving quilts to them, there was a “quilt making activity” started by a young volunteer group in order to encourage the mind-lost women still in temporary houses. Our quilt group gladly joined the group to support them with a belief that it will inspire those women so that they will find a joy of creation and find hope and dream for their future. We are most pleased and gratified to exhibit our 9th quilt show from Japan at La Conner Quilt and Textile Museum. We sincerely hope you can read our wishes and thoughts, stitched and sewn in these quilts. ​Feeling deeply sorry for the forgotten and discarded cotton fabrics in Japan, Junko has been working on preserving them. For hundreds of years, cotton fabrics had been preciously and broadly used for common people’s bedding called “Futon” and working jackets called “Hanten” until synthetic textiles were introduced. She collected the fabrics from north to south and made countless miniature Futon and Hanten in one sixth of the normal size. This space does not allow us to display all of them but I hope you will enjoy and appreciate her deep love for the textiles and insatiable passion for her creations. Junko Maeda has been working with Japanese natural fiber textiles such as silk, linen and cotton, for nearly forty-five years. 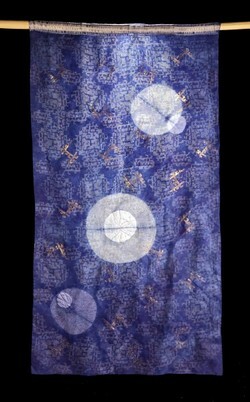 They are used not only in quilts but in piece works, clothing, Sashiko works, etc. In the past several years, she has been inspired by handicraft called “Pojagi.” Pojagi is Korean women’s traditional patchwork handed down from mother to daughter in the family. Traditionally, a woman used scraps, worn fabrics, swatches collected from each member of the family and made pojagi, giving her whole mind in her work for the purpose of unifying the family and wishing them everlasting wealth and happiness. 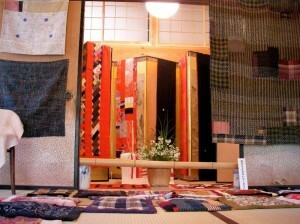 Junko traveled to Korea several times and made a research in material fabric called ramie and traditional Pojagi. She has interpreted the construction, color and the beauty of Pojagi to her own style and created new art works which are displayed in this Museum. 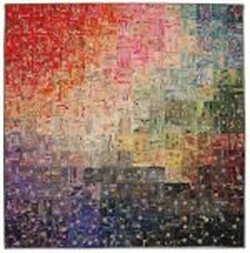 It is my great pleasure to have this opportunity to exhibit the works of Junko Maeda who is well known as a quilt artist in Japan. Two of her quilts are in the collection of the Museum of Arts and Design in New York. The first floor of the Museum is hosting fiber art work by the participants of the Indigo & Silk Challenge. The artists were required to use the indigo fabric and a one of four orange silk fabrics! Even though the fiber artists have used the same fabrics, the work they have submitted is wildly diverse and includes fiber art quilts, wearable art, and even sculptural pieces. 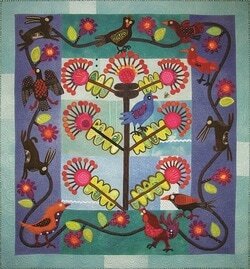 The challenge was issued as part of our 2013 Quilt & Fiber Arts Festival. The Indigo & Silk challenge features a fat quarter of indigo cotton, donated by Kona Bay Fabrics, and vintage silk pieces, donated by Kimono Blossom/Ako Shimozato. 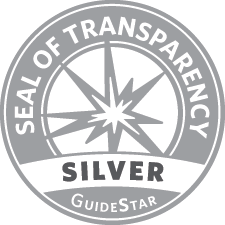 Thank you to both companies for assisting us in this challenge! This exhibit highlights a collection of crazy quilts and embroidered suzanis that were gifted to the museum by the Miriam Wosk Family Trust in late 2012. The quilts and suzanis were collected by California artist Miriam Wosk (1947-2010) over her lifetime. Miriam was born in Vancouver, Canada and found commercial success as an illustrator in New York in the 1960′s through 80′s. The textiles in this exhibit, along with her many collections of decorative items, served as inspiration pieces for her elaborate collage and painted works. In the words of Kristine McKenna in the book titled Abundance and Devotion: The Art of Miriam Wosk, Miriam’s aesthetic is “a convergence of styles and influences, and incorporates elements of everything from folk and decorative art to Surrealism and kitsch . . . (her) imagery seems to spring from the lush, mysterious realm of her dream life, and the terrain of her late work has the quality of an underwater garden.” The museum will also have images of select works from Miriam Wosk as examples of how textiles influenced her art, and an original tapestry from the collection of Wosk’s son, Adam Gunther. To learn more about Miriam’s life and work, visit www.miriamwosk.com. ​The La Conner Quilt & Textile Museum thanks Adam Gunther, Amy Stephenson, and the Miriam Wosk Family Trust for their invaluable assistance in bringing a part of Miriam’s work and collection to the Pacific Northwest. We also thank art history professor and longtime museum member Phil Morrison for his generosity in helping to facilitate this gift. We also welcome the La Conner Quilt & Textile Museum’s former Executive Director, Liz Theaker, as the guest curator of this exhibit. 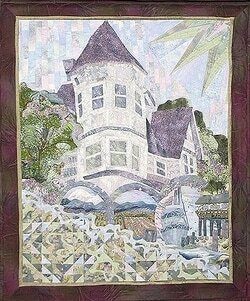 January 11 - March 23, 2014 Throughout the years, fiber artists have depicted the Gaches Mansion using their own particular techniques. On display will be the Mansion done in a hand stitched Welsh Quilting style, an applique style using vintage silk kimono, a photo transfer technique with bead embroidery, applique and pieced collage, and stitched in an embroidery design. Each January, the Museum starts the year with a selection of crazy quilts. The Crazy Quilting craze started around the 1880s when American quilters picked up needle and thread to create these highly embellished quilts. While some Crazies might include fans or other recognizable patterns, the style often features random sized patches sewn onto a foundation fabric. 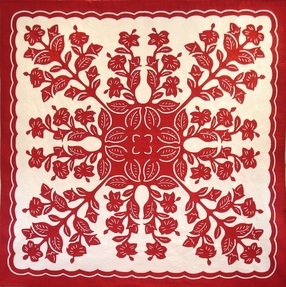 The edges of the patches are covered with embroidery stitches; often, the patches may include paintings, ink work, or embroidery. Whether made by an individual to show off their sewing skills or by a group as a gift, these highly embellished quilts reach through the years to inspire new generations of quilters and embroiderers. Surface design is the creative exploration of fiber and fabric. The one-of-a-kind artwork blends many techniques including collage, weaving, felting, beading, basketry, hand-dyed fabric and contemporary quilting in cutting-edge combinations. 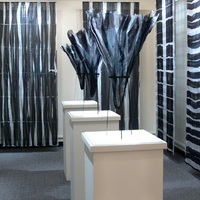 All members of the WISD art group are also members of the international Surface Design Association. Since its conception in 2008, the group has grown to over 32 members, all residing on Whidbey Island in Washington’s Puget Sound. Visit Whidbey Island SDA for updates and artist profiles. 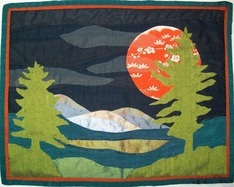 I am primarily a self-taught stitcher, quilter and artist. Southern Africa has had a considerable influence on my life and creativity. I was born in Zambia and then educated in South Africa where I also trained to be a nurse. I soon moved to England; this shift between two very different environments and cultures inspired many of my designs. The stark contrasts between the arid beige and browns of the African bushveld and the lush greens of the rolling hills of Southern England have continued to be a rich source of ideas. 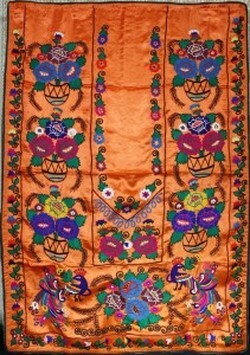 Primary influences have been the beautiful and colorful work of primitive, craft artists around the world. I am influenced especially by the energy and color of traditional African designs. All these early experiences combined to stir my love of “primitive” arts and crafts and grew into my focus on contemporary folk-art. Do the tulips and other flora of Washington inspire you? 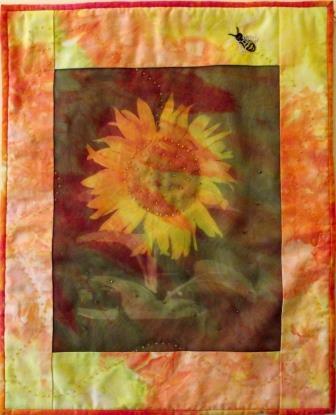 Friends and members of the La Conner Quilt & Textile Museum were issued a Challenge to use a floral theme and to be creative and experiment with a variety of fabrics, fibers, and textiles. On display will be the results of their efforts. 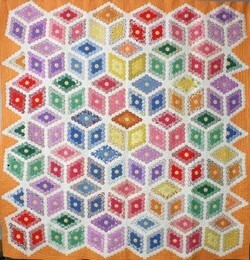 Quilts made during the 1930’s Depression years often display bright colors in spite of the hard times. These cheerful quilts brightened the lives of the makers and their families. On display this quarter, will be selected quilts from the Josie Teeter Schlotterback Collection, a collection that spans fifty years of quiltmaking. 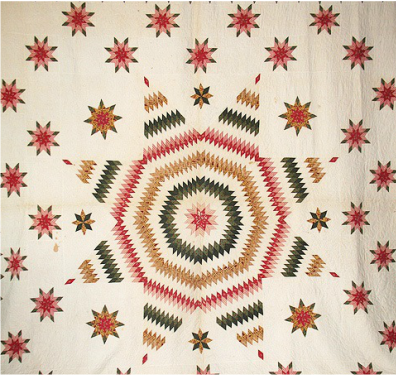 The display will include a hexagon Grandmother’s Flower Garden (seen at right), a Lily Quilt, and a Circle Star Quilt (seen below) along with some recently finished quilt tops on display for the first time at the Museum. Another favorite hexagon quilt on display this quarter will be a beautiful Mosaic Quilt (seen above, left). This quilt is a recent addition to our collection and it features hexagons formed into diamond blocks that are arranged into a Tumbling Block setting. This quilt is all hand pieced and hand quilted, as will be many of the quilts on display.